In some way the blogosphere is a great field for ethnographic studies and everything is worth some examination regardless of the topic. It doesn’t always have to be so serious or intellectual, the average person just ain’t that deep. 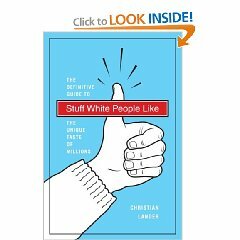 You can examine these texts and figure out a lot about our society and no matter how interesting it is… It is, to me, always overshadowed with the fact that only white men are privilege enough to make books (blogs) like this. I know I won’t live to see they day when a Japanese woman write the book “Stupid East Asian women” or a black man write the book “Stuff black people like” – and get away with it. (They might do it but they won’t get away with it.) And that’s also a part of the society we live in.